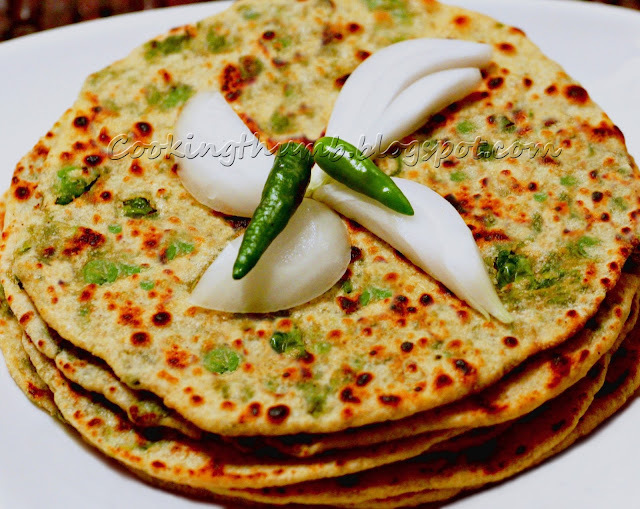 Like other stuffed Parathas, Matar Paratha too tastes great with pickles and yogurt. You will be amazed at how something that tastes so great can also pack in a whole lot of nutrients. Whole wheat is low in saturated fat, very low in cholesterol, and a great source of dietary fiber, manganese and selenium. Coupled with the low saturated fat, low cholesterol and multiple vitamin and minerals in Peas, this Matar Paratha is a powerhouse of nutritional benefits. Mix 1 1/2 cup flour and 1/4 tsp of salt into a deep bowl. Add water gradually as required into the bowl and knead to make a medium stiff dough. Drizzle 1/2 tsp of clarified butter/oil in the bowl and knead the dough again till it is fully mixed into the dough. Cover with a damp cloth and keep aside. Mash the blanched green peas coarsely. Heat 1 tbsp of oil in a pan on medium heat. Add onion & ginger. Sauté for 3-4 minutes. Add asafoetida, cumin powder & cayenne pepper. Mix..
Add peas & salt to taste. Sauté for 10-12 minutes or till the mixture seems dry. Add green chillies. Mix & sauté for a minute. Add cilantro leaves. Mix. Switch off the heat & remove the mixture from the heat. Let the pea-onion mixture cool down. Once cool, divide the mixture into eight equal portions. Shape each portion into small balls. Keep aside. Divide the dough into 8 equal portions & shape into a ball. Cover with a wet cloth. Take a dough ball. Roll it into a three-inch disc. Place a ball of stuffing in the center of the rolled dough. Bring together all the edges in the centre & seal tightly such that the stuffing does not come out. Flatten the stuffed dough with your fingers gently. Dust with flour. Roll it gently and slowly with a rolling pin to approximately 6 inch diameter. Place a non stick griddle (Tawa) on medium heat. Let it heat for two minutes. Place the rolled dough on it & cook for a minute. Turn it & drizzle clarified butter/oil on it & spread it to cover the entire surface. Flip over & spread oil/Clarified butter on the other side as well. Cook till both sides of the rolled dough are golden brown. Remove it from the griddle and place it on an absorbent paper. Prepare the remaining parathas in the similar way. Serve hot with fresh yogurt, Green chutney or pickle of your choice. Thanks Helena for liking the recipe. Do try it, its very delicious & nutritious too. Do let me know how it turns out :) Happy Cooking! Looks Delish! Will try it for sure!